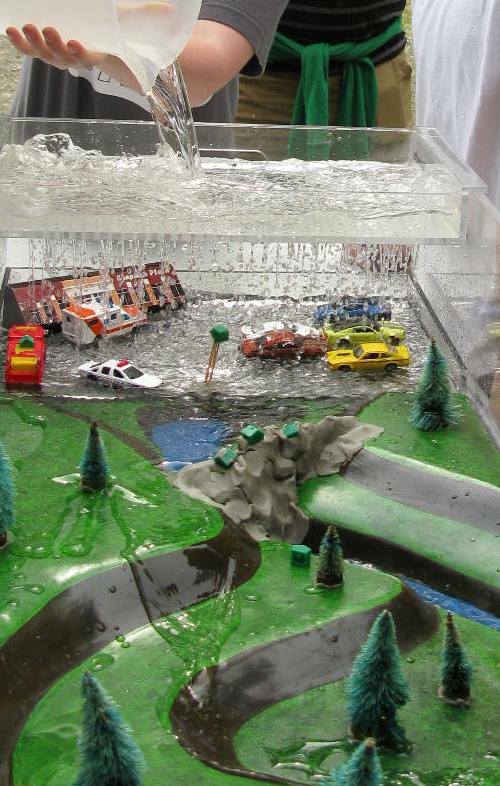 EES owns a tabletop model that simulates the effect that different landscapes have on runoff and the potential for flooding. When it rains on “wetlands,” sponges provide lots of capacity for the landscape to absorb water. The same amount of rain on a “parking lot” causes the river to overflow onto the floodplain and may wash monopoly houses downstream—unless they were constructed with proper anchoring techniques. Of course, the shopping center construction project should have included stormwater management, and the model can also demonstrate the use of a retention pond. Unfortunately, the pond may not hold enough water when consecutive storms (remember all the rain before the 1972 Agnes flood?) cause the already-full retention pond to overflow and flood out a monopoly house neighborhood. We can also use clay to elevate houses, build levees, construct dams, or implement other flood protection strategies. 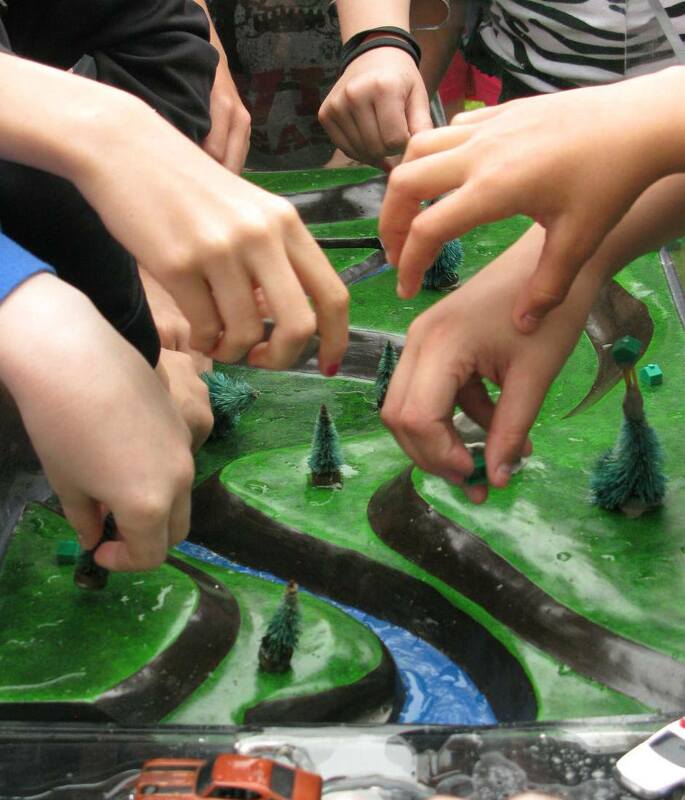 EES uses this model with students as a fun way to demonstrate the impact of land use changes on downstream flow and then do hands-on experiments with flood protection techniques. Students collect river level data and can later see plots of what happened. 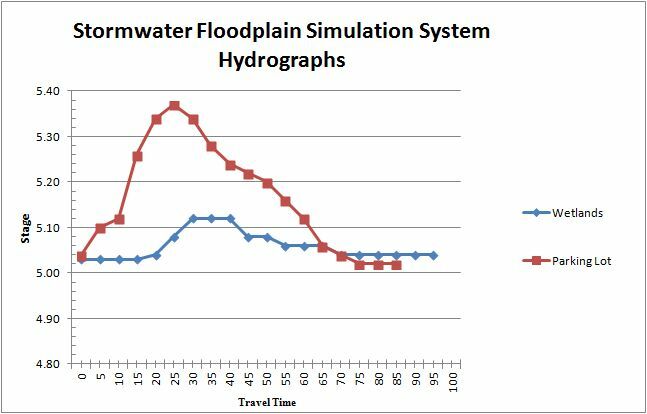 The model is also used with adults to illustrate floodplain management concepts—sometimes drawing a floodplain map right on the model. 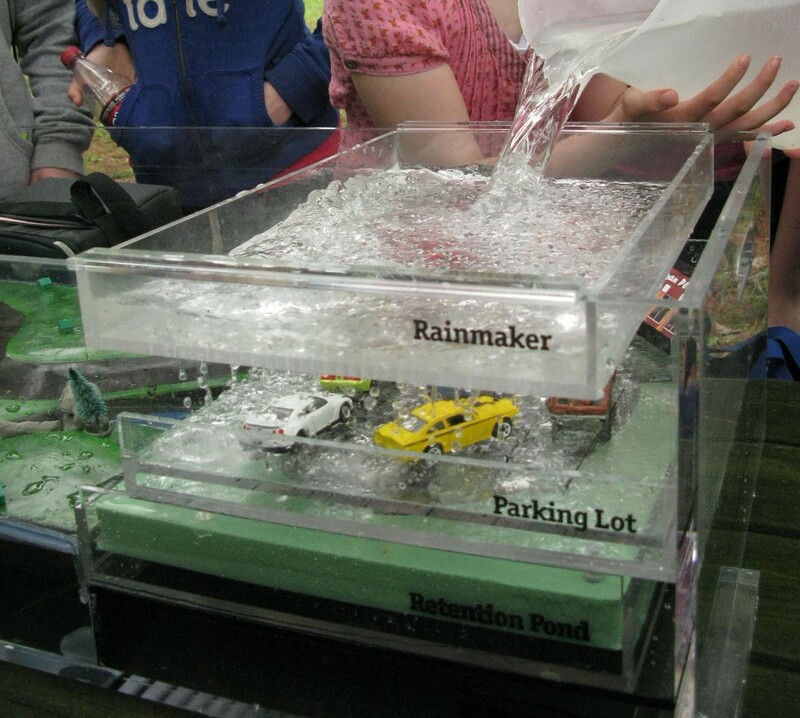 EES purchased this tabletop model for use throughout Chemung, Schuyler, and Steuben Counties and is seeking volunteers to expand its use for flood education. Please contact us to schedule a train-the-trainer session or to invite us to bring it to your organization. Flash floods may occur with little or no warning. Learn how to prepare with flood safety and insurance information. If you live in or near a 100 Year Floodplain, you have a 25% chance of being flooded once every 30 years. Flooding from small streams, roadside ditches, ponds, and lakes have caused widespread damage to homes and properties in our tri-county area. In the last 150 years, rivers and streams have inundated vari­ous communities from Hornell to Wellsburg on an average of once every 4 – 112 years. Find out your flood hazard by looking at Flood Maps (FIRMs) at local government offices. Call your jurisdiction to find out where. All development in a floodplain, not just building construction, requires local permits. It is a violation to dump debris, including yard wastes, into a creek, stream or river and it should always be reported to your municipality. A building in the floodplain that sustains substantial damage or is substantially im­proved must be brought into compliance with current standards. The floodplain provides a green space for protec­tion of streams from development and the forces of erosion. Never ride bicycles, ATVs or motorcycles on flood control dikes as the grass that is ruined actu­ally helps to hold the dike together in high water events. Area wetlands can help improve water quality by filtering out impurities and nutrients from runoff. Homeowner Insurance policies do not cover damage to your home from flooding. Residents in Chemung, Steuben and Schuyler Counties can obtain Flood Insurance through the National Flood Insurance Program (NFIP) cover flood damages to your home and its contents. Without Flood Insurance, many residents have lost their homes and belongings due to flooding, and have never recovered financially. Insurance through NFIP can also be purchased by renters to insure their personal belongings. There’s a 30 day waiting period for coverage to begin. Find out about NFIP today, don’t wait until the next flood to find out your home is not covered. Many municipalities in our tri-county area participate in the Community Rating System which can lower the price of flood insurance for the residents, making it even more affordable!